Vintage guitars often come with a trade off: the "good ones" got played- hard. As a result they have lots of character. I don't mind character- in fact I love it. I like seeing some scratches in the top of a guitar or the wear marks on the side of the neck from 60 years of first position chords. Every once in a while however I will come across one that is clean. This Wilshire, my friends, is CLEAN. In 1957, Gibson bought a financially failing company that had been their long time competitor. The Epiphone brand was known for very fine instruments like banjos, archtop electrics and acoustic guitars. The competition was especially fierce in the large body electric archtop market. Gibson would come out with a big jazz box and a month later Epiphone would come out with a slightly bigger or more fancy one. Epiphone manufactured out of New York until about 1953 manufacturing moved to Philadelphia (although the labels still said New York!). The failing company was at odds with its employees and the name was eventually bought along with a bunch of parts by Gibson. Gibson began manufacturing Epiphone guitars first with leftover parts and continued by introducing their own Epiphone models. This was a move by Gibson to get more guitars in stores. Retailers didn't want 10 Gibson SGs but didn't really have a problem buying 5 SGs and 5 Epiphone Wilshires. The USA Epiphones were made right along sides of the Gibsons in the factory at 225 Parsons Street, Kalamazoo, MI. These are very high quality instruments! 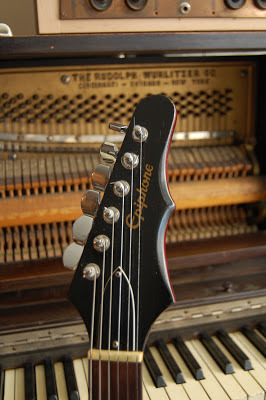 The quality of the instruments bearing the Epiphone brand didn't drop to the current level until that unfortunate time in the 70s when the new owners of the Gibson brand (Norlin) shipped all production over seas to Japan. The Epiphone Wilshire was a bit of a rare model until the its reissue this past year (made in China- sadface). 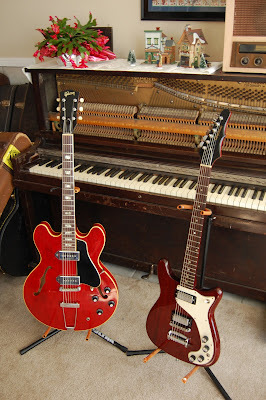 It has always had a small Mahogany body and neck but had two different editions. The first was introduced in 1959 with a 3+3 headstock and P-90 pickups. 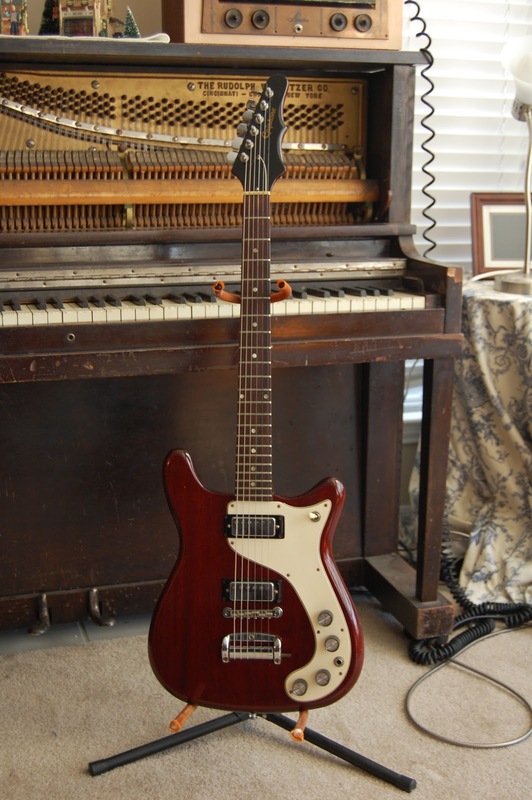 The second version appeared in mid-1962 that had a funky "batwing"style headstock and two mini humbuckers. Mine is the second version with the silky smooth mini hums. I absolutely love these guitars. They have the coolest 60s styling with quality ingredients to boot. The mini humbuckers are very versatile and can take you from Guns and Roses to Neo-classical jazz in a real hurry. The neck joins at the very last fret so the player has full advantage of the fretboard. Unfortunately the "Vibrola" was a source of frustration for most players so the trem arm is usually taken off and lost. This is my second mid 60s Epiphone Wilshire. My first one had seen some playing time and the finish showed it. It was still original (but was missing the trem arm of course). I eventually sold it but still had my love of Wilshires. When I saw the ad for this one I couldn't believe it. The seller was the original owner and the finish looked like it had just rolled off the assembly line. I asked him when and by whom it was refinished. He said that it hadn't been refinished. Well, I have heard that before. I always take that kind of thing with a grain of salt. When I showed up to look at the guitar I still couldn't believe it hadn't been refinished. We met outside of a Waffle House so I couldn't really take the pickguard off to check. It looked "right" so I went ahead and bought it. I took the pickguard off but the wires kind of stuck. I looked closely to see what was going on. Yes, the wires were stuck in the lacquer. I carefully peeled them away to find that I was the first one to ever take the PG off. This was clearly the original finish. There was even a little bit of router dust in the electronics cavity. That was a cool moment but I totally regretted it after! I knew I had to take the pg off to verify the originality of the finish and electronics but I wish that it had still "never been taken off." Oh well. There is no checking on this guitar. NONE. It looks like it was made recently. This thing is as real as it gets. There are a couple of nicks around the guitar (about 3). That is all. The original owner was not keen on the original set of tuners so he had them changed to mini Schallers. He also lost the tremolo arm. Other than that, this is the way it came from Kalamazoo. One thing that is weird is that the gold Epiphone silk screen logo was done once, painted over, and done again slightly more centered. Must have been a new guy at the silk screen booth that day. The seller said he went into the shop in '67 to buy a Gibson SG. He saw this one up on the wall and bought it instead. Good call. I don't think he played it very much because it has hardly any fret wear or wear on the back of the neck. It is an absolute joy to play I hope you get a chance to play one of these oddities sometime too. I took this guitar to the Nashville guitar show and another dealer was interested in it. He took it over to an amplifier and played it for a while. When he came back he told me that the pickups were wire out of phase! That was news to me but I wouldn't have noticed it because I stick mainly to the neck pickup. I took it out this morning and messed around with it and found that he was probably right. One other thing I found interesting is that the bridge pup is rotated 180 degrees from where it "should" be. I asked the original owner why he swapped it and he said that he didn't. That is the way that it came from the factory. 1953 Gibson J-45 nicknamed the "Workhorse"